U.S. Sen. Bob Corker, R-Tenn., talks to GM's head of global design, Ed Welburn at the Detroit auto show. DETROIT -- Tennessee U.S. Senator Robert Corker came to the Detroit auto show today and said Chrysler LLC needs to find a merger partner and General Motors is carrying too much debt. Corker, a freshman Republican, emerged as a point man in the automotive debate after he and a group of Southern lawmakers blocked auto-bailout legislation last month. 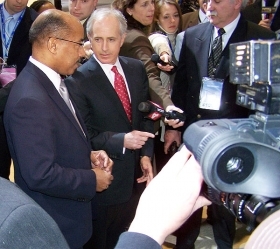 Leading a throng of reporters on the floor of the show, Corker said he came to Detroit in response to a plea by Michigan Attorney General Mike Cox. Cox asked lawmakers to visit the show in a column published in Tuesdays Washington Post. Corkers visit underscored the attention the industry has drawn as the U.S. economy reels from the longest recession since the early 1980s. At the end of 2008, U.S. auto sales had plunged to levels not seen since 1982. In response to a reporters question about Chrysler, Coker said the automakers best chance of survival is with a partner. Chrysler probably needs to merge with somebody, not necessarily go away from the standpoint of existence, he said. It appears to me based on what I have looked at that they have not invested in technology and those kind of things necessary to be a standalone. After the bailout legislation failed in Congress, the Bush administration last month pledge $17.4 billion in loans for Chrysler and GM from the $700 billion bailout fund for the financial industry. Chrysler and GM each have received $4 billion so far, and GM is targeted for the balance. Corker, whose home state includes a GM assembly plant in Spring Hill and the North American headquarters of Japan's Nissan Motor Co., said he was concerned about GMs debt load. Corker also addressed criticism hes received for asking the UAW for wage concessions as part of a compromise that ultimately failed in the Senate. The senator said he was misquoted and that he never said UAW workers earned too much money. The U.S. Treasury still required the UAW to take wage concessions as part of the White House bailout. A proposal to strip the Corker-inspired labor provisions from the automaker rescue was included in legislation introduced in the House of Representatives last week to expand the government's $700 billion corporate bailout program.